The Loom & Leaf is a memory foam and foam mattress that boasts higher density foams than we typically see, at less expensive price that what you'd see in a store. But do the high quality foams make a meaningful difference in support and pressure relief? If you’d prefer to watch rather than read, check out our full Loom & Leaf mattress video review above. Note: Loom & Leaf is made by the Saatva Company, one of the most well-established companies that sells mattresses exclusively online (since 2010). 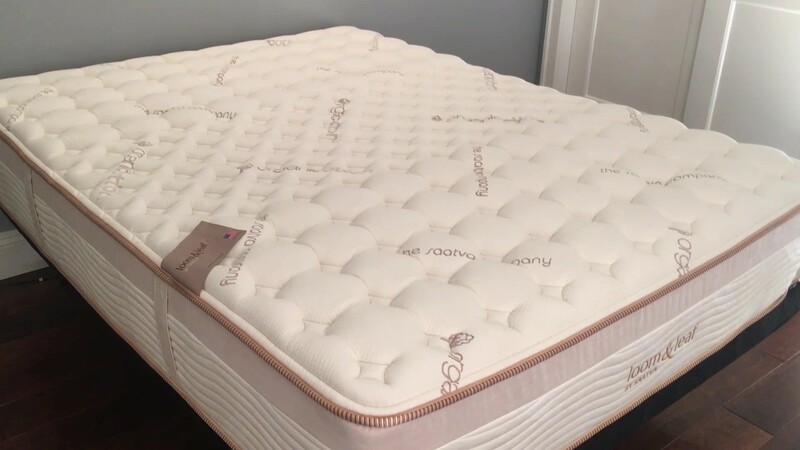 In addition to the Loom & Leaf memory foam brand covered in this review, they also offer the flagship Saatva mattress, a coil-on-coil innerspring lineup, as well as the Zenhaven latex bed. We reviewed the Relaxed Firm version of the Loom & Leaf mattress. While most of our ratings and classifications would be the same across either of the two models, there are a few characteristics that do vary across these versions – most notably, softness and cushioning depth. Likewise, our assessments of spinal alignment (a.k.a., back support) and pressure relief for various types of sleepers would also vary somewhat across versions, as discussed in our review. GoodBed's Take – Who is the Best Match for a Loom & Leaf Mattress? The Loom & Leaf Mattress is a memory foam mattresses with four layers: two of high density gel memory foam atop a transition layer and a support layer of polyurethane foam. Fused to the middle third of the top of the mattress is a thin layer of gel, intended to help conduct heat away from the body. The mattress comes in two comfort variations: Relaxed Firm and Firm (Loom & Leaf comfort comparison). We reviewed the relaxed firm version. Both mattresses are a stated 12” tall, but we found the mattress to be closer to 13” once we factored in the loft of the quilted mattress topper, which has some interesting properties of its own. In our evaluations, we found the Loom & Leaf mattress to have a Medium softness level, with good overall pressure relief and back support for our tester, making it a particularly good choice for back and side sleepers. If you’ve experience memory foam before, you know that its hallmark characteristic is a slow response; if you press the mattress with your hand and remove it, it takes quite a while for the mattress to recover its original shape. It’s completely personal preference whether you like this aspect or not; it imparts a feeling that you’re slowly melting into the mattress. The quilted cover of the Loom & Leaf mattress plays a role here, as it does not contain memory foam, and tends to mute or dampen that memory foam feel somewhat. So if you’re an “in the middle” person who likes the best of both worlds—that melting feeling along with the feeling of floating on top of a mattress, the Loom & Leaf mattress might be right for you. Other notable performance factors: Our tester easily moved and repositioned on this mattress, and edge support was also a highlight compared to other memory foam models (which don’t typically excel in this aspect). Motion isolation was also a real highlight; if you are concerned about feeling your partners movements on the bed, or perhaps have pets that like to jump on the bed, we found that movements on one side of the Loom & Leaf mattress were barely perceptible on the other. Our main concern with this mattress was for stomach sleeping. While the 4+ inches of memory foam made back and side support very good, it proved too soft for stomach sleeping in our view. For our tester, this meant that his hips and midsection sunk deeply enough into the mattress to create an over-arched back, which could lead to back pain down the road. And while spinal alignment in the back sleeping position was very good for our tester, we surmised that very heavy people (250 lbs and up) could sink in too deeply and might instead check out the firm version of the mattress. The Loom & Leaf mattress’s price is very competitive, especially given what we judged to be its high quality materials; free shipping is included, along with in-home setup and removal of your old bedding, a “white glove” service that typically costs $100+ extra with other brands. The 120-day trial period should give shoppers some peace of mind but note that returning the bed invokes a $99 service fee for pickup. You can place the Loom & Leaf mattress atop the support of your choice, including a separately purchased box support, a bed frame, platform bed, or adjustable bed frame. The company sells its own foundations, along with a Lineal adjustable foundation. Overall, the Loom & Leaf mattress performed well in our testing and evaluation for pressure relief, back support, and heat transfer. It was exceptionally easy to change sleeping positions, and we deemed edge support to also be a cut above compared to other memory foam mattresses. We judged construction to be of high quality, and the brand includes some eco-friendly features. The Loom & Leaf mattress is a memory foam over foam mattress, meaning that it’s top two layers include gel, giving the foam that slow-recovery behavior we’ve come to attribute to memory foam. The topmost layer is a 2” convoluted gel memory foam (3 in the image below) in a 4 lb density (foam density is expressed as pounds per cubic foot). You’ll recognize ‘convoluted’ as egg-crate foam. Fused to the central third of the top of the mattress is a thin layer of gel intended to help channel heat away from the body (2 in the image below); the company called is Spinal-Zone Gel. The Loom & Leaf Mattress’s second layer is flat (not egg crate) gel memory foam in a 5 lb. density. The company claims that this foam is “bio-based” meaning that it uses some plant-based oils in its manufacture as a substitute for petroleum (typically about 20 to 30 percent, coming from renewable plants like soybeans). After that you’ll find a 2” polyurethane foam transition layer; this layer is firmer than the memory form but less firm than the lowest layer, a 5” layer of polyurethane foam. Covering the Loom & Leaf mattress is a quilted pillowtop made partly of organic cotton. We tugged and crunched the pillowtop and found it to be well constructed and sturdy during our testing period. The company also uses Guardin, a natural antibacterial fabric treatment, in the fabric. Keep in mind that what mattress companies call “firm” or “soft” is a purely a preference. All mattresses should be supportive and promote healthy spinal alignment. Whether a mattress is fluffy and squishy (what mattress companies call soft), or less so (what companies call firm), is purely down to your personal needs and preferences. The Loom & Leaf mattress is available in two versions. We tested the relaxed firm (the softer version). A firm version is also available. Overall, we class the relaxed firm version of the Loom & Leaf mattress a “medium,” right in the middle in terms of softness. Much of the ‘sinking in’ feeling of the Loom & Leaf mattress comes from the pillow-top cover, which has deep contours and quilting. When we placed our 16-pound bowling ball atop the mattress, it sunk down quite deeply, more deeply than we typically expect from a memory foam mattress. When our 200-pound tester laid on the mattress, however, we noted cushioning depth as closer to average; where compressed, the slope of the mattress to the body was gradual, giving a feeling of floating on top of the mattress more than sinking deeply into it. Overall, we class cushioning depth as medium, a blend between sinking into the mattress and floating on top of it. Compared to an innerspring mattress, memory foam mattresses are typically slow responding. That is, when you press your hand into the mattress, for instance, then remove it, it takes a while for the hand imprint to disappear. We call this slow recovery, and users often describe it as a sort of melting sensation. In the case of the Loom & Leaf mattress, with 4+ inches of memory foam, we would normally expect a very slow responding mattress. However the thick quilted cover on the mattress does not include memory foam, and tends to dampen or mute the slow-responding memory foam feel, resulting in a foam mattress that is quicker responding than most. When we tossed our 16 lb. bowling ball onto the Loom & Leaf mattress, it bounced just a tiny bit, but not much, and when our 200-lb. tester dropped onto the mattress, he didn’t bounce at all. So this is definitely not a bouncy mattress. Overall, we thought the Loom & Leaf mattress offered very good support, especially for those who sleep primarily on their backs. 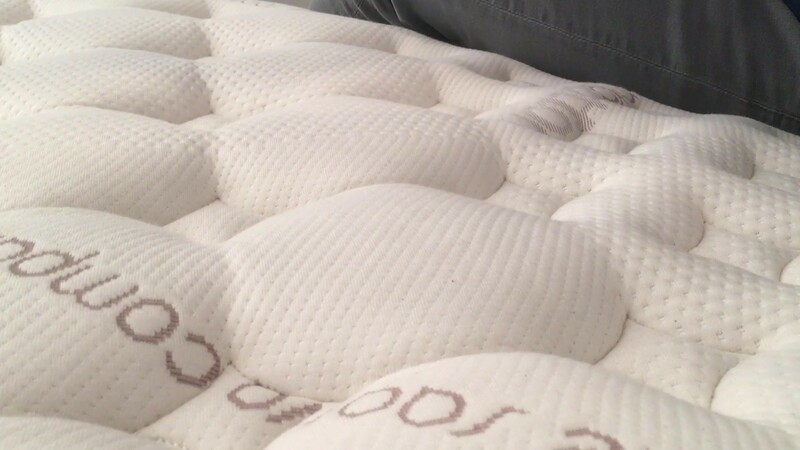 Our tester felt his hips sink into the mattress just the right amount, leaving his spine in a neutral position thanks to the 4+ inches of memory foam up top. Note that those who are much heavier (250+ lbs.) than our 200-lb tester might sink too deeply into the mattress, and with no very-sturdy innerspring layer below the memory foam, heavy sleepers might experience a sort of hammock effect. For those individuals, the firm version of the Loom & Leaf mattress might be worth consideration. Slide sleeping also proved very good in our evaluation. Our tester’s shoulders and hips sunk deeply enough into the bed to create good spinal alignment. Even heavier individuals, we felt, would be comfortable in a slide sleeping position, where you do need hips and shoulders to sink into the mattress’s memory foam. So if you are primarily a person that sleeps on their back and side (most common), we feel the Loom & Leaf mattress is a strong contender. When our tester rolled into the stomach position, however, he felt his hips sink too deeply, and more sinking in his midsection than preferable, resulting in his back over-arching a bit, and a back that arches too much can contribute to back pain. If you are primarily a stomach sleeper, the firm version of the Loom & Leaf bed might be a better choice. Our 200-pound tester felt very well supported while on his back, with very good spinal alignment and lumbar support. Lighter and slightly heavier people should have a similar experience, while those over about 250 lbs might want to choose the Firm version of the mattress instead, as hips could sink too deeply into that 4+ inch layer of memory foam, creating a hammock effect that could throw alignment. Spinal alignment for our tester in the side position was good, noting that his shoulders and hips sunk appropriately into the mattress, resulting in a neutral spine position. Overall, we felt that the Loof & Leaf would be a good match for most that sleep in a side position. 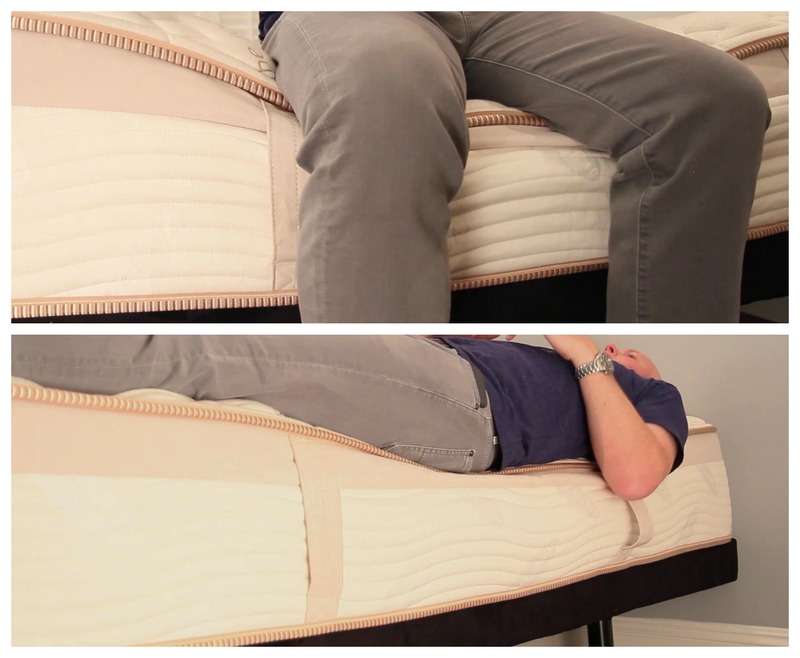 Achieving good spinal alignment for stomach sleepers can often be trickier as the hips can tend to sink down too far with some mattresses, and we found that to be the case here. Our tester’s hips and midsection sunk down further than idea, creating arch in the back. For heavier people, we surmise this effect could be even more pronounced. The firm version of the mattress is likely a better choice for stomach sleepers, though we did not test this version. Overall, we found the pressure relief offered by the Loom & Leaf mattress to be very good, owing to the top two layers of memory foam. Our tester did note that the thick quilted cover gets in the way a bit, inhibiting the memory foam slightly, but nothing that was worrisome. Even heavier people, we feel, would not experience pressure points on this mattress. With a bowling pin standing upright on the Loom & Leaf relaxed firm bed, we tested motion isolation by dropping a 16-lb. bowling ball on it; the bowling barely moved at all, and remained upright. Similarly, when our tester dropped his full weight onto the bed, the pin remained practically motionless. If not feeling your partner’s movements on the bed is a high priority, the Loom & Leaf bed performed exceptionally well in our tests. If you are a “hot” sleeper, or perhaps a woman who experiences hot flashes, how a mattress affects your body temperature may be a concern. Memory foam mattresses have a reputation for getting warm, but Loom & Leaf takes steps to prevent this. 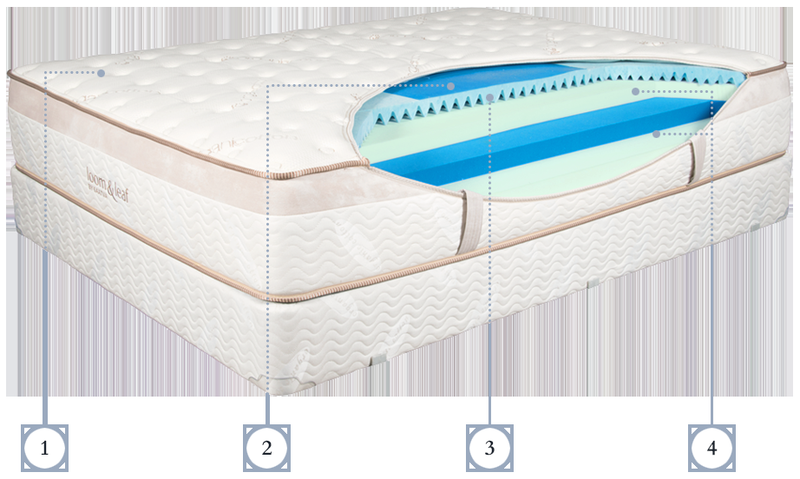 First, the convoluted (egg crate) design of the top foam layer helps promote airflow, and the gel contained in the memory foam, as well as fused to the middle third of the top of the mattress are both designed to help conduct heat away from the body. We think that most people will not find the Loom & Leaf to be a hot mattress, especially compared to other memory foam models. If this is a major concern and priority, innerspring or pocketed coil mattresses, including the Saatva mattress (made by the same company) might be a better choice. If you like to sit on the edge of your mattress, or if you tend to sleep right on the edge of your mattress, you want a model that has good integrity and stability around the edges. 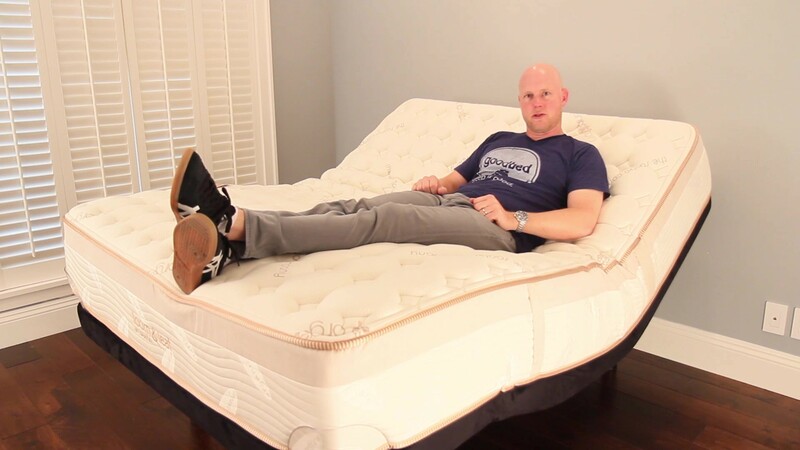 In our tests, which you can see in our video review above, our tester was able to sit very comfortably on the side of the mattress. Although there was substantial dip in the mattress when he did so, he never felt unstable. Laying right along the side of the mattress also felt very stable, especially at first. We did notice a bit more of a leaning sensation once our tester’s body warmed the memory foam, but nothing that was concerning. Overall, we found edge support to be good, especially for a memory foam mattress. One of the highlights of the Loom & Leaf mattress, for our tester, was ease of movement, particularly for a memory foam mattress. The quilted cover especially helped our tester feel that he was never “in a hole.” While ease of movement might be even easier with an innerspring bed, we didn’t feel that moving around on the Loom & Leaf would be an issue. In the case of the Loom & Leaf mattress, we noted the potential for some confusion. While the quilted cover does contain some organic cotton, the word “organic” printed on the fabric could lead some consumers to believe that the entire mattress is made of organic materials; it is not, nor does the company make any claims that it is. Similarly, the label of our test mattress included the words “eco-friendly,” and the company also uses this term on their website. While the company does use some plant materials in its foam, it’s still chemically processed. The foam is, however, certified to the Certi-PUR-US standard, which verifies that a material has low VOC off-gassing as well as a lack of chemicals and other substances regulated by the CPSC. The company does say that one of its 19 factories in the United States runs exclusively on solar power. Overall, while the Loom & Leaf mattress is not made entirely of natural materials, the company does include some organic cotton in the cover, along with some plant-based foam, and some eco-friendly company policies. If you plan to use your mattress atop an adjustable base, the Loom & Leaf is a good choice. In fact, the company even sells its own adjustable base called the Lineal (see our separate review of the adjustable base). Our test mattress conformed very well to our adjustable base, with no strange lumps or buckling. Foundations are available in two heights, an 8.75” version and a low profile 4.75” version. You can also use the Loom & Leaf mattress on top of a platform bed, or on an adjustable foundation, including the company’s own version. The Loom & Leaf is a 12” memory foam mattress that measures closer to 13” once you factor the loft of the quilted top cover. You’re getting over 4” of memory foam as the top two layers, comprised of 4 lb. and 5 lb. density foam—particularly high quality foam that you’ll see in the best and most expensive mattress-store models. In our tests, the Loom & Leaf mattress proved excellent for back in side sleepers in particular. Edge support, ease of movement, and motion isolation also received high marks in our tests. We pulled and tugged at the mattress and found it to be well constructed and solid, with a premium look. Lastly, the mattress has a few green touches, including some organic cotton in the cover, some plant-based foam, and some forward-thinking company policies. For memory foam mattresses, foam density is our best, though imperfect guide to longevity. We believe the Loom & Leaf bed compared extremely well to its peers, with particularly high quality foam in 4 and 5 lb. densities, and construction quality that seems built to last. Price-wise, the Loom & Leaf mattress compares extremely well to its online peers. A queen size mattress is priced at $1,099, which includes white-glove delivery service, setup and removal of your old bedding (optional). We feel the mattress also stacks up extremely well against a luxury memory mattress you might find in a traditional mattress store, and for the price, we judged materials to be of premium quality. Altogether, the think the Loom & Leaf bed is an excellent value. When we first reviewed the Loom & Leaf mattress in our video above, there was a $99 delivery charge. The company has since changed its policy to include free shipping, free in-home setup, and free removal of your old bedding. This is a policy that now matches or exceeds that of the majority of Loom & Leaf’s online competitors. Loom & Leaf offers buyers a 120-day trial period. Should you decide to return the mattress during that period, there is a $99 fee for pickup. Some context: The Loom & Leaf mattress is a piece of furniture, delivered by movers with a truck. You can see how returning this type of mattress is a more expensive proposition for a company (and ultimately for you). Even so, several of the company’s online competitors do offer free returns. Be sure to check the Loom & Leaf return policy. One of the biggest, if not THE biggest complaints about any mattress from consumers regards body impressions—the inability of a mattress to spring back, eventually creating a low spot/sinkhole in the mattress. As such, mattress warranties all contain a term defining how big a sag or ‘body impression’ (measured when no one is on the mattress) is considered a defect, and thus covered under the warranty. The industry standard for mattresses is generally between ¾” and 1.5”. Loom & Leaf has chosen to cover indentations that meet or exceed 3/4”—a comparatively very generous indentation policy. Practically speaking, that means any softening or sagging would need to be at least that deep before the warranty would offer you protection. For the first two years of ownership, Loom & Leaf will replace your mattress (including shipping) if it falls under warranty coverage for no charge. For years three through 15 of the warranty, the company will repair and re-cover your mattress, but consumers are required to pay a $99 shipping charge each way ($298 total). Summary: Is the Loom & Leaf Mattress Right for You? Overall, we found the Loom & Leaf mattress to be of high quality and a particularly excellent value. Based on our findings, here’s who we think is the best and worst match for a Loom & Leaf mattress. Keep in mind that we reviewed the relaxed firm version of the mattress. Some individuals might consider the firm version of the mattress for what we feel would be better back support. Is the Loom & Leaf bed right for you? Take our Mattress Match Quiz to find mattresses that fit your needs, based on your preferences and price range. Looking for a little more on the Loom & Leaf mattress? Visit LoomandLeaf.com.